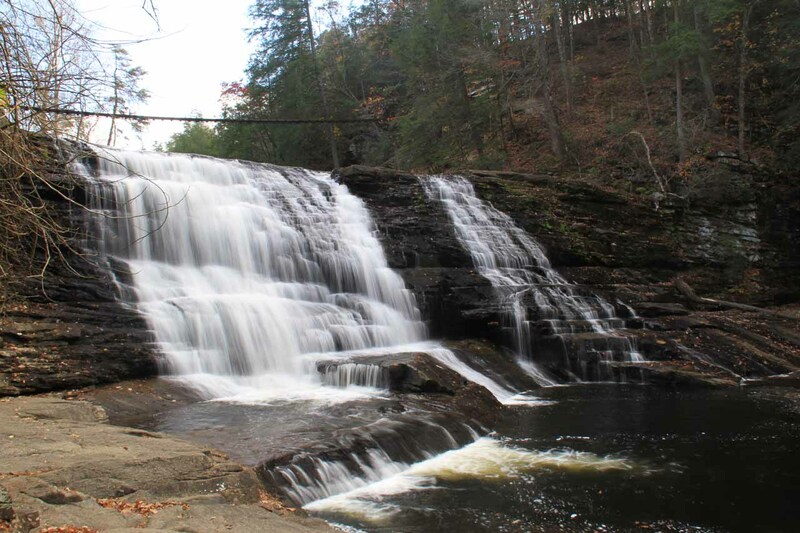 Cane Creek Falls is said to be an 85ft waterfall on Cane Creek, which is responsible for the deep Cane Creek Gorge of which is one of the main features of Falls Creek Falls State Resort Park. 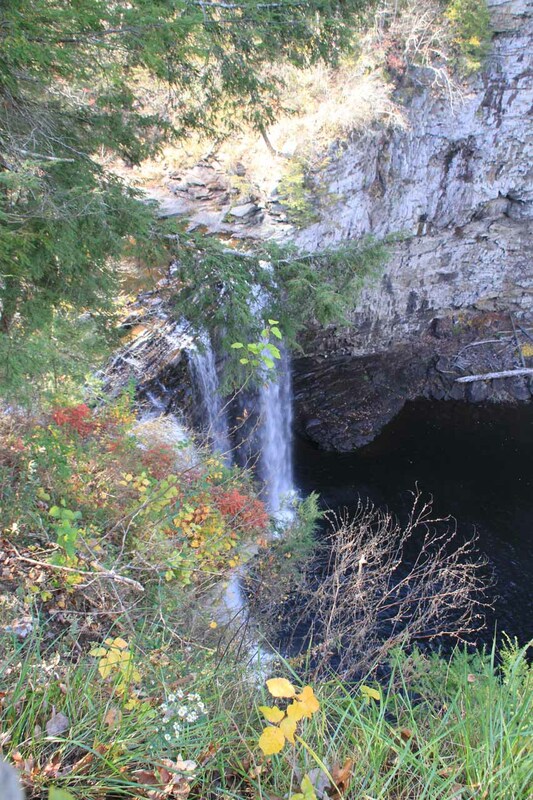 During our visit, this falls was also accompanied by the tall (125ft) but thin Rockhouse Creek Falls or Rockhouse Falls. 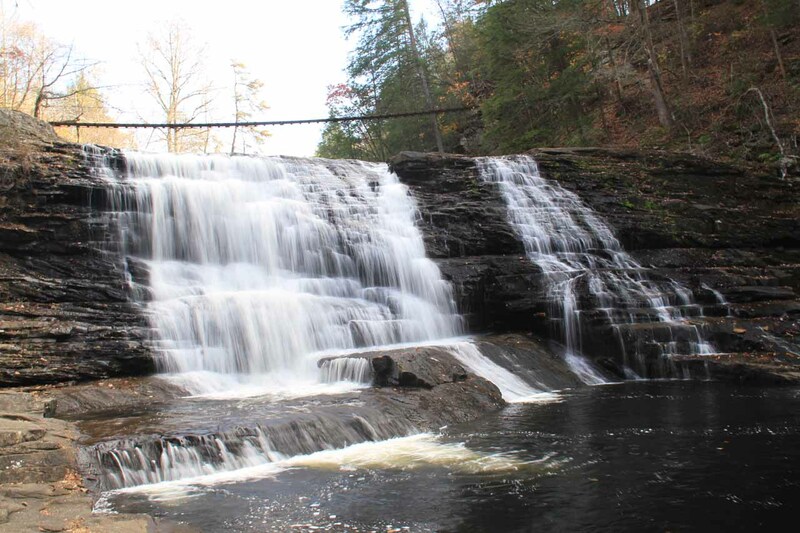 I also passed by the 45ft Cane Creek Cascade, which looked like a pretty popular place to go for a swim if Cane Creek had low enough flow. 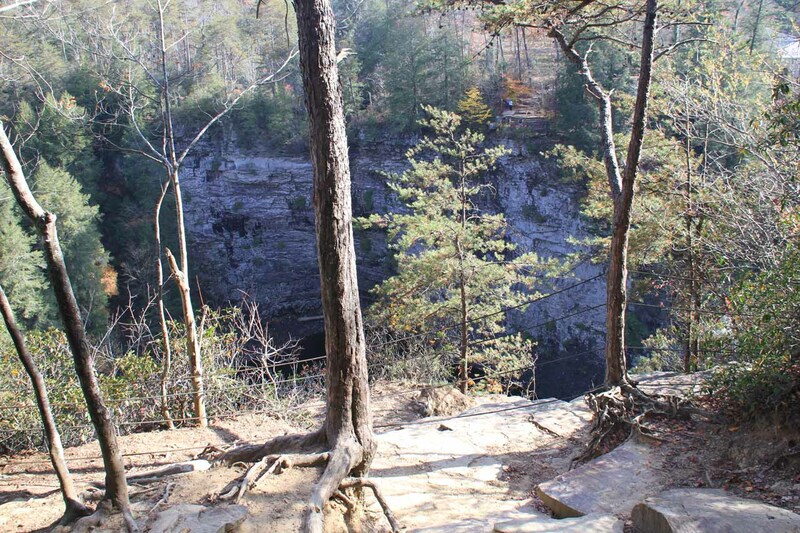 I saw some photos in the literature of Cane Creek Falls shown from its base, but after talking with the ranger at the Betty Dunn Nature Center, it turned out that getting that view required a steep descent down the so-called Cable Trail. I opted not to give this one a try since the ranger’s description made it sound dicey (though I will always second-guess my decision). However, I did take an alternate trail for a better view of this waterfall. 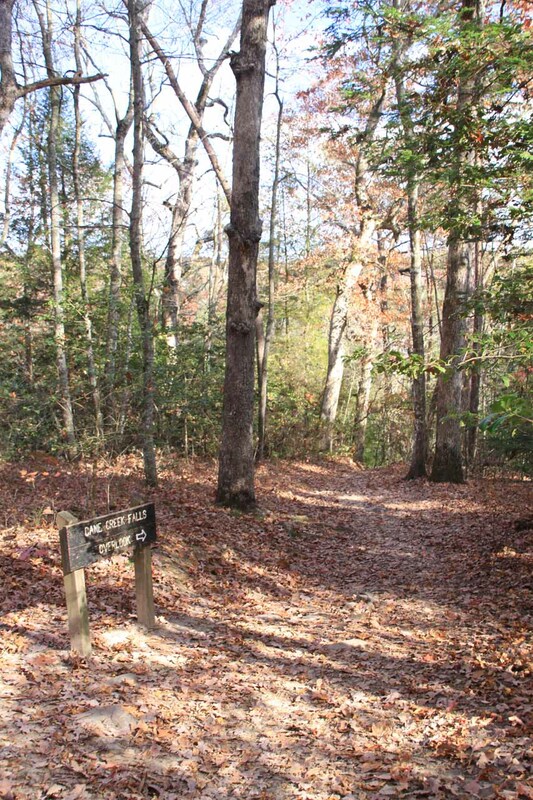 From the Nature Center car park (see directions below), it was only a short walk down some steps to a precipitous but overgrown overlook of the steep gorge harboring both Cane Creek Falls and Rockhouse Creek Falls. 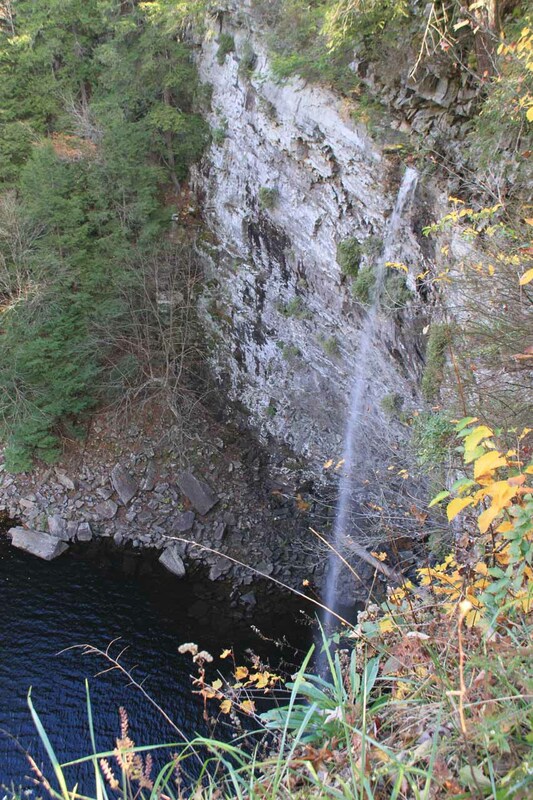 While Rockhouse Falls was visible from this overlook, Cane Creek Falls hardly had a satisfying view. 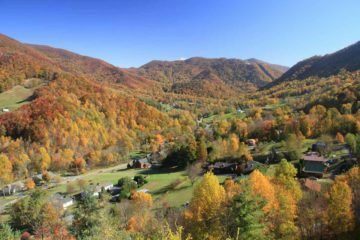 So I took the trail leaving the Nature Center towards Falls Creek Falls. 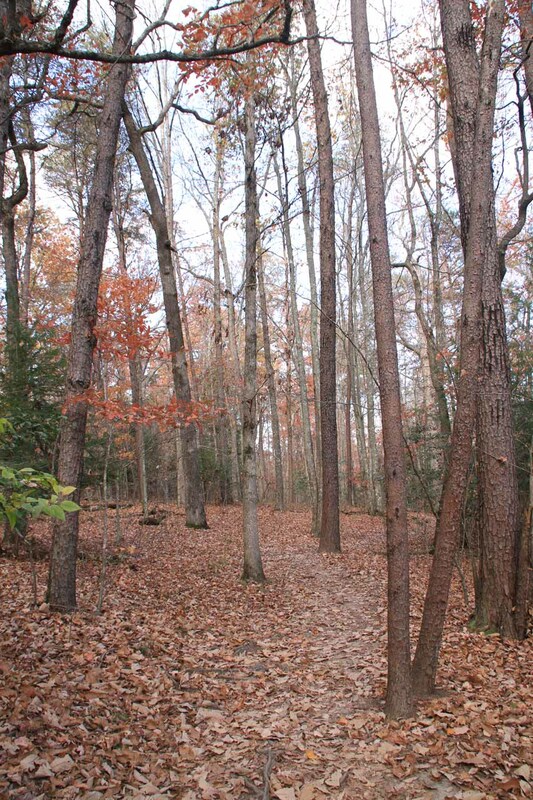 However, right in back of the Nature Center, there was a short spur trail that led down to the pretty Cane Creek Cascade. 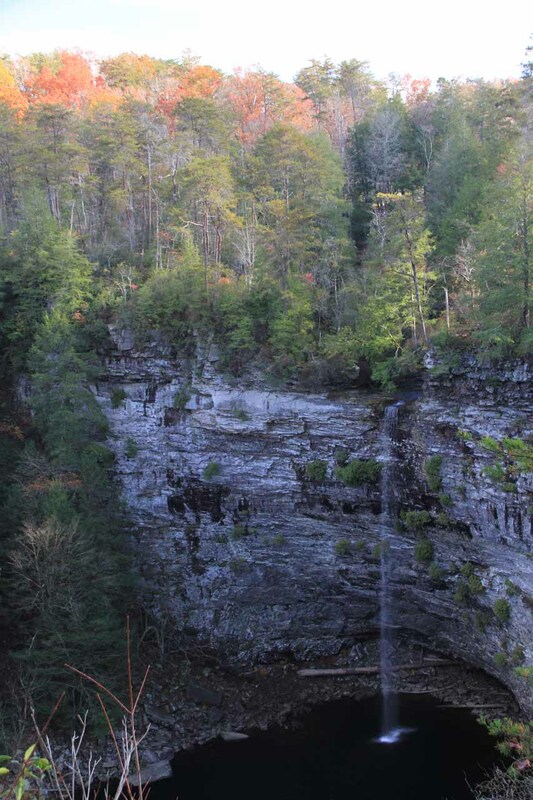 Accessing the banks of Cane Creek in front of the cascade required a short but steep scramble that might require using your hands as well as your legs to safely make it. But if Cane Creek happened to be swollen, I would strongly caution against getting near the creek as not far downstream of here would be the plunge over Cane Creek Falls. 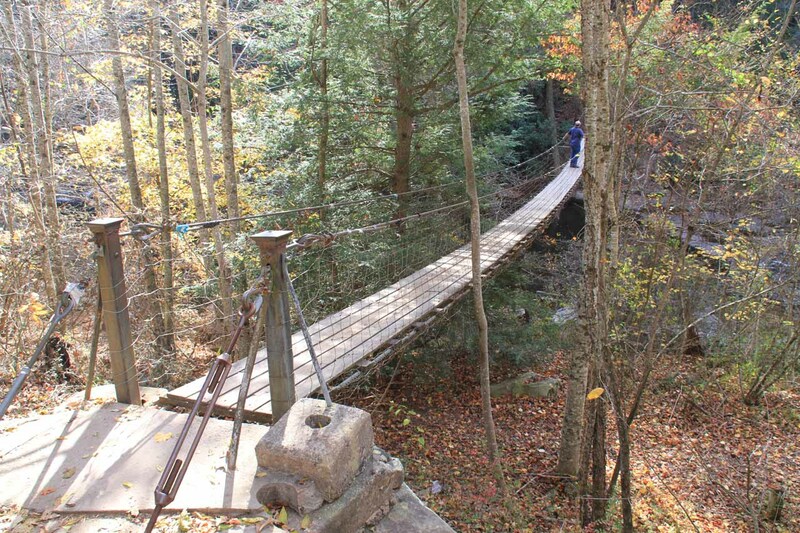 When viewing the Cane Creek Cascade, I noticed there was a swinging bridge above the falls. 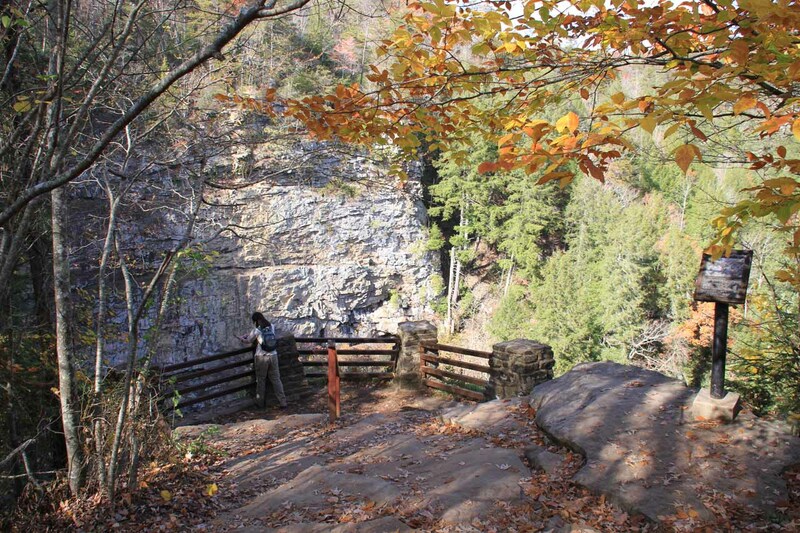 It turned out that that bridge was part of the trail leading to Falls Creek Falls as well as the Gorge Overlook promising to yield better views of Cane Creek Falls. 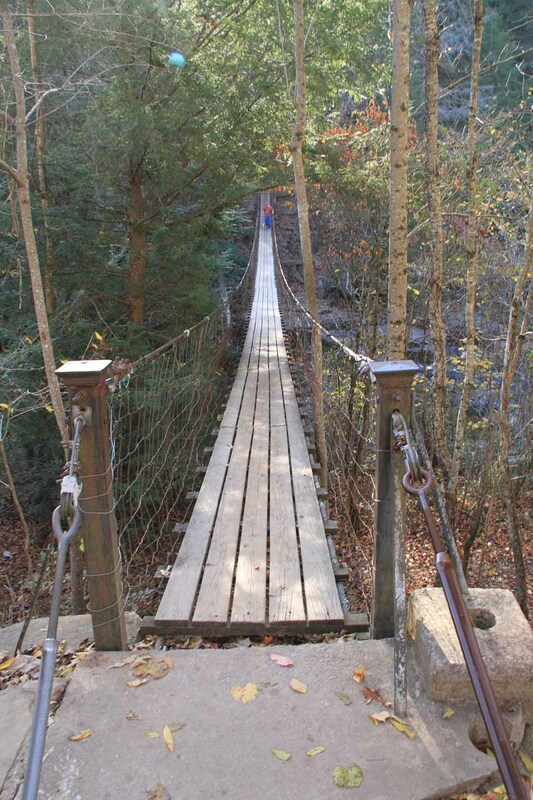 So when I had my fill of Cane Creek Cascade, I continued back on the main trail, then waiting my turn to cross over the long swinging bridge over Cane Creek. I believe there was a person limit on the bridge, but this path saw enough traffic to sometimes cause queues on either side of the bridge. On the other side of the bridge, the trail then went uphill. 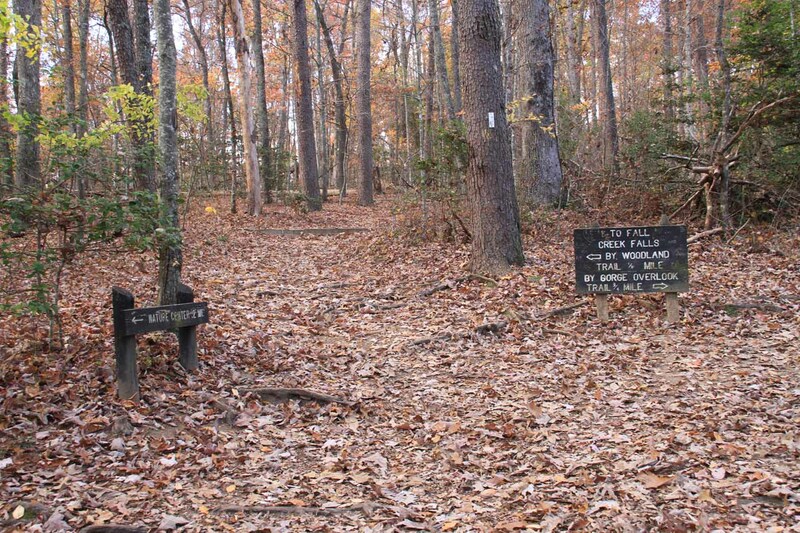 At the top of the climb, there was a trail junction where I took the path leading towards the Gorge Overlook. 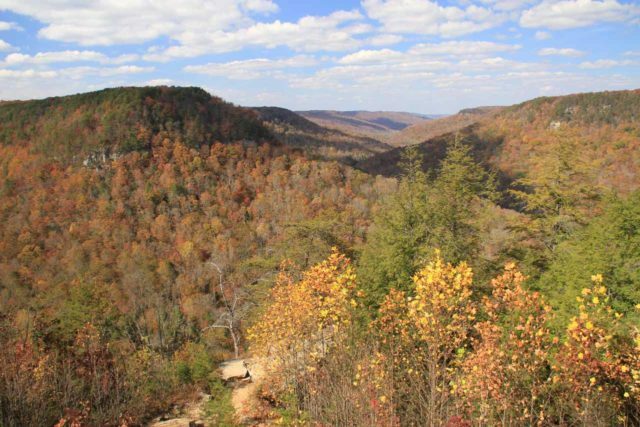 After a little bit of a descent, I managed to reach the overlook where I was able to see both Rockhouse Creek Falls and Cane Creek Falls together. 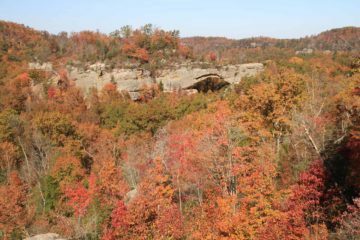 I was also able to look across the gorge at the overlook near the Nature Center while some of the folks over at that overlook spotted me (I could tell by the pointing in my direction)! This was about as good a view as I could get of Cane Creek Falls without doing the Cable Trail, and the view of Rockhouse Falls was wide open. This overlook was probably about a mile or so one-way from the Nature Center so it would probably be about 2 miles round trip with some elevation gain and loss. It took me about 75 minutes to do this hike including the time spent taking photos. 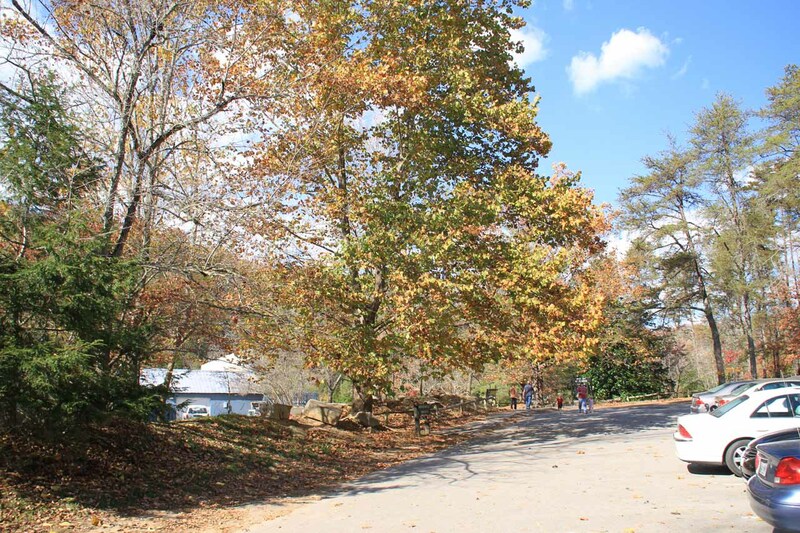 See the Falls Creek Falls page for directions on getting to the Betty Dunn or Cascades Nature Center. 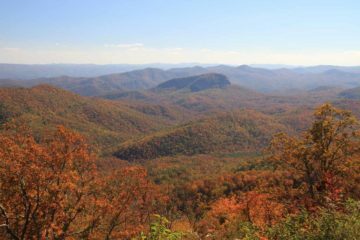 That would be the place to do this excursion while requiring the least amount of hiking. 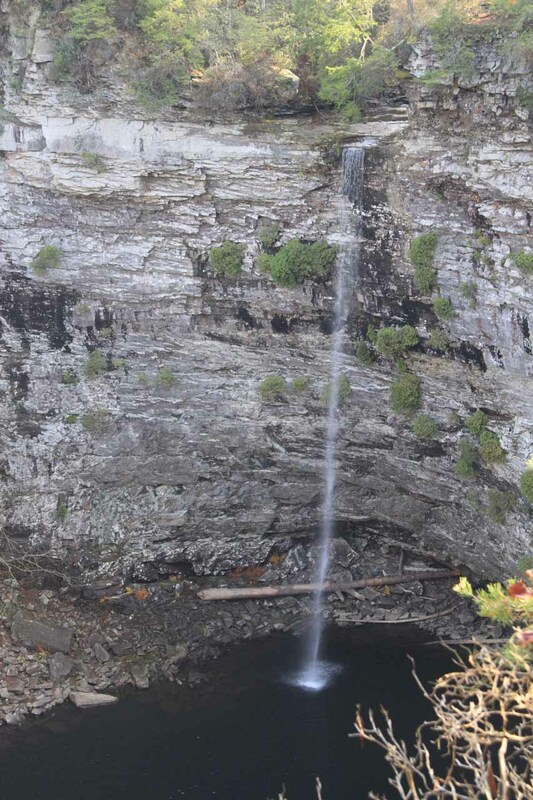 Otherwise, it’s possible to make the excursion longer by combining this with Falls Creek Falls as well. I believe it’s about 1.1 miles between the Nature Center and Falls Creek Falls Overlook. For context, the main town neighboring Falls Creek Falls State Resort Park was Spencer, which was 31 miles (over 30 minutes drive) south of Cookeville, 68 miles (over an hour drive) north of Chattanooga and 21 miles (30 minutes drive) east of McMinnville, where we had overnighted after making our visit to Falls Creek Falls State Resort Park.